I was more interested in the predicament the Medici circus troupe are in. Given the pre-depression era, not all the world building exists to make me wonder how the close-knit family of circus performers, including the Farriers, are faring in those difficult times. They certainly look out for one another when it matters. The impossible is possible in Dreamland (a dark mirror of Disneyland). This identity which V. A. Vandevere (Michael Keaton) is wonderfully slick at masterminding is an echo of what Max Medici (Danny DeVito) was considering in the first act. Both want to exploit Dumbo’s ability to fly. Had the story diverted to finding Dumbo’s herd and capturing more, I would be hooked. Technically, this era was one of exploration and such practices were not unheard of. I can imagine Tarzan returning. Does Disney need a shared universe? No, but to connect unrelated dots would have at least made keeping up with the live-action films far more interesting than inspired by or a frame by frame remake. Bringing DeVito and Keaton to this film is the only great part of the film. Their sleazy characters come to life and I enjoyed seeing Medici redeem himself. Milly and Joe tend to dote on Dumbo more than to inspire. Milly’s subplot of being a pioneering scientist is largely ignored. When it does matter, it has no point in the story and it becomes more of a footnote to encourage youths seeing this film to never give up on their dreams. The principal plot has its moments. 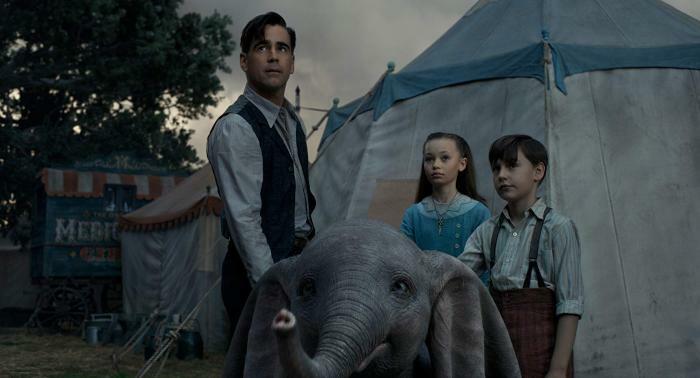 To answer why Dumbo matters is in how everyone, be it human or animal, who comes together stays together. True to the pack behaviour of this mammal, elephants form deep family bonds and this aspect of the film is perhaps the main reason why this take exists. To reunite the child with mama is important, and to find her mishandled is barely enough to start the animal rights movements back then, but I digress. The latter half of this film is better when Tim Burton gets to ply his trademark visual style. The art direction and the set designs when everyone is in Dreamland is very much Burtonesque. He excels more with adding the gothic to any work he’s tasked to create. I have to ask how he got away with making a clear critique of the bosses who hired him to make this film. I also have the feeling of a lot of studio interference affected what went into the script and in what Burton wanted to put to film. The few nods to the original animated work had no place. On this list includes the mouse whom Dumbo befriends and the pink elephant ballet. As dreamy as the latter sequence was to create, it did little to amaze. The only bits of story which I did like was with the era and the difficulties everyone had to face to remain strong. The odds were tough. At least happiness exists when the effort to overcome those obstacles is made.